Polo is a 32-year-old guy who plays to Popmundo. He goes by the name Jörgen Thorstensson in game. He's currently hanging out in a flashy pink dustbin in the marvelous city of Clermont-Ferrand right in the center of France. He fell in love with Popmundo — which was better named Popomundo at this time — around three and a half minutes after joining the game. In the early days of 2008, the puppet master of Carl Bettray quit the game and put down his website listing all skills. 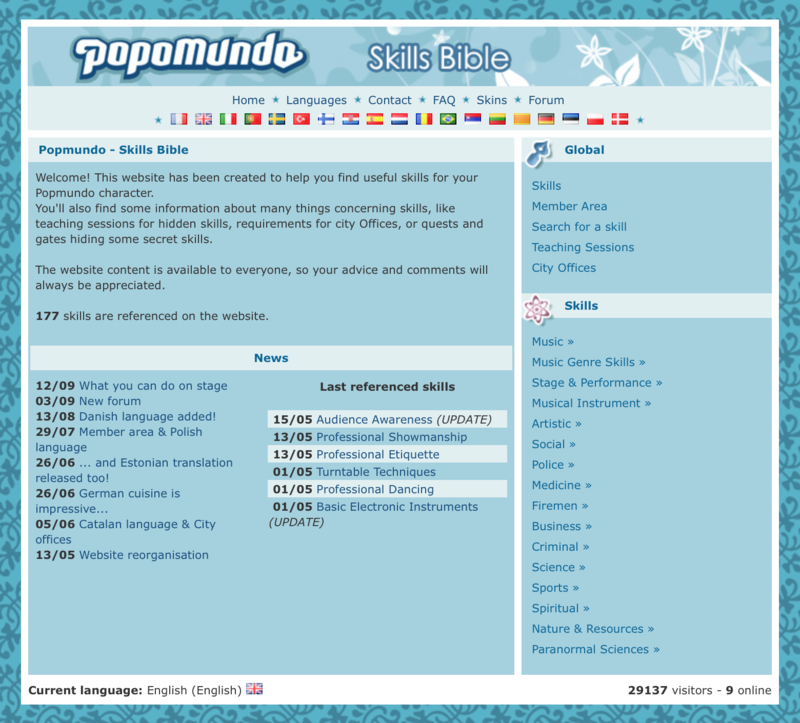 Polo couldn't stand this horrible situation, so on February 5th, 2008, he released the Popmundo Unofficial Skills Bible, which progressively turned into Popmundo Bible. He made everyone believe it was mainly to help people, but the truth was he wanted to lose his mind by coding this dirty website. He slowly became mad and now needs medication to look sane to other people. Jörgen Thorstensson is my main character in Popmundo, and is around 103 years old (he lost many years thanks to the Picture of Dorian Gray and some other tricky miracles from Kobe). He usually looks like one of my most favorite musician, Jeff Buckley, but it can also happen to look like a laughing bearded man. 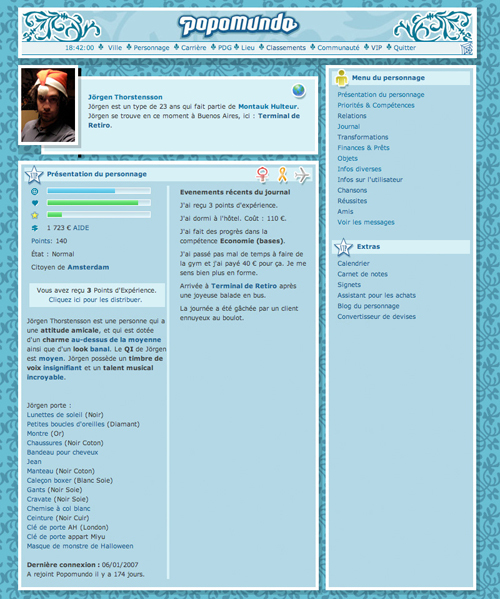 I joined Popmundo and created Jörgy ten years ago in July 2006, and I translate the game in French since January 2008. I'm a French player, who used to teach music for a while, and now works as a master data administrator which basically consists in having "master" in my job name — among other more interesting facts. Here are some other stuff & projects which I'm related to, as musician, webmaster or coffeemaker — or both of them. I was crushed underneath a falling piano and rushed to the hospital. The doctors say I'll probably not make it. Mysterious men in red robes stormed in and tied me down to a drying rack. While spanking me with soft cushions, they told me to behave better in the future... or else! !